Texas A&M trial looking at unique data for forage sorghum, including varying feed values and management needs of different hybrids. Unique data for forage sorghums, including varying feed values and management needs of different hybrids, is coming out of a Texas A&M AgriLife trial being conducted near Bushland, Texas. “On the Texas High Plains, forage sorghums are a very good fit with the livestock industry, especially as dairy and beef cattle forage needs increase at the same time as we become water limited across the Ogallala Aquifer region,” said Dr. Jourdan Bell, Texas A&M AgriLife Extension Service agronomist in Amarillo, Texas. Forage sorghums are a drought-tolerant, water-efficient alternative to corn, Bell said. Bell said the data from the forage sorghum trials on a cooperative farmer’s land near Bushland will be unique because she is working with Dr. Ed Bynum, AgriLife Extension entomologist, and Dr. Ted McCollum, AgriLife Extension beef cattle specialist, to evaluate the effect of the sugarcane aphid pressure on forage sorghum production and quality. “There is such a vast difference in production and quality between sorghum types and hybrids, so it’s really important that we evaluate different forage sorghums specifically for silage to help producers optimize not only their production with regards to tonnage but also the quality at harvest,” Bell said. That’s where the value of the forage sorghum trial — currently in its third year — comes in, Bell added. Her work is a continuation of long-term research conducted at Bushland for more than 15 years. 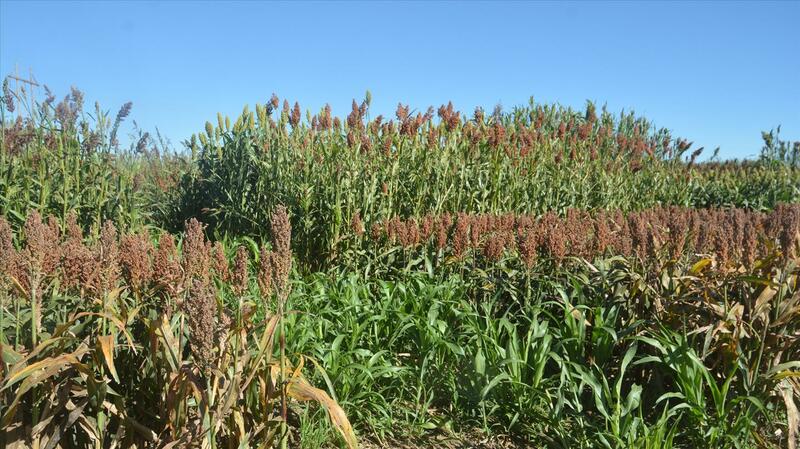 The Bushland forage sorghum trial includes more than 100 different sorghum hybrids, including forage and grain sorghum types. Measurements are being taken for yield and quality at harvest, she said. While finished silage is ultimately a result of the product used, it is important that end users recognize that their management can affect the quality of the silage. Bell, who also has a Texas A&M AgriLife Research appointment, is conducting a secondary study, funded by the Texas Grain Sorghum Board, to evaluate ensiling duration with a select forage sorghum. She will be aided in the research by a West Texas A&M University graduate student. “We are looking at forage that has been ensiled for 30, 60 and 120 days to optimize the feed value — both digestibility and carbohydrate availability — for a forage sorghum that has been processed with both a cracked and uncracked berry,” Bell said. Another area of concern for the end user is grain processing, she said. Oftentimes, the sorghum berry is not cracked when it is ensiled, which can reduce the feed value and carbohydrate availability. One added challenge this year has been sugarcane aphids, she noted. “We have sprayed sugarcane aphids twice throughout the growing season. However, there is concern that there are potential reductions in both yield and quality, so we have a very timely opportunity to evaluate its effect on production and quality of the forage,” Bell said. She added that several different forage sorghum hybrids have been infested with sugarcane aphids at various levels and will be ensiled to determine how the level of sugarcane aphid infestation affects the end use product. Bell reminded producers that using drought-tolerant forage sorghum does not necessarily mean they can avoid irrigation. Forage sorghums managed for optimum production can use 0.3-0.4 in. of water per day at periods of peak water demand on the Texas High Plains. Bell said harvest continues on the forage sorghum trial, with results expected in a month or so. The optimal harvest time for forage sorghums is at the soft dough stage, but this trial includes multiple maturity classes and forage types that range from early-maturing hybrids to photoperiod-sensitive hybrids that do not initiate heading until the day length is less than 12.5 hours, or around mid-October on the Texas High Plains. “This has really extended the harvest times and slightly delayed the complete data collection,” she said. The complete set of data will be posted online in the next couple months at http://amarillo.tamu.edu under the Agronomy tab.